We’ll help you arrange the perfect charter to disperse ashes at sea off the beautiful coast of Orange County in peace and comfort, for a meaningful and dignified final farewell. We have a wide range of Coast Guard certified vessels operated by our professional crews. Captain Dave’s has received “five-star” ratings on TripAdvisor, Yelp, and Google. We are proud to have received the TripAdvisor Certificate of Excellence award every year since 2011. And we are very proud to be a two time recipient of the TripAdvisor Hall of Fame award. We offer five boats to choose from. The best burial at sea vessel for you will depend on several factors including, but not limited to, the number of passengers you’ll have and your budget. We offer five boats to choose from. The best burial at sea vessel for you will depend on several factors including, but not limited to, the number of passengers you’ll have and your budget. Don’t hesitate to call us at 949-488-2828 if you are unsure which boat would be best for the burial at sea service you’re arranging. Burial at sea price for 90 minutes*: $810 plus $90 gratuity. *Extended trip times are available on request. ORCA is Captain Dave’s deluxe motor yacht. She is Coast Guard approved to carry up to 6 passengers. This vessel features include a fast cruising speed, beautiful interior with dinette and ample seating, two bathrooms, and a fully appointed galley. You’ll enjoy panoramic views while comfortably seated in the fully enclosed bridge or the refreshing ocean air on the aft deck or bow. Learn more about ORCA or take a 3D tour of the boat. To inquire about ORCA please call 1-949-488-2828. With speeds up to 30 knots, Fast Cat is the fastest boat in our fleet. Comfortable and upscale, this boat features heavily padded seats with seat backs, large custom sunshade, custom teak floor, and a unique catamaran hull designed for a smoother, more stable ride than ordinary rigid hull inflatable boats (RHIBs). Fast Cat is inspected and certified by the U.S. Coast Guard for safety. Learn more about Fast Cat. To inquire about Fast Cat please call 1-949-488-2828. Burial at sea price for 75 minutes: $675 plus $75 gratuity. Each additional 30 minutes is $270 plus gratuity. This sailing catamaran is the original pride of our fleet and features Eye-Spy Dolphin Nets on the bow, comfortable seating in the cockpit, and a restroom. DolphinSafari can comfortably accommodate about 20 passengers. If you have a few children in your group, then we are Coast Guard certified for more, up to 22 passengers. Learn more about DolphinSafari or take a 3D tour of the boat. To inquire about DolphinSafari please call 1-949-488-2828. Burial at sea price for 1 hour: $1,040 plus $120 gratuity. Each additional 30 minutes is $520 plus gratuity. Our high-tech sailing catamaran, Manute’a (pronounced mah-noo-tay-ah), offers a large covered cabin with cushioned seating, two exclusive Eye to Eye Underwater Viewing Pods, three Eye-Spy Dolphin Nets, and two bathrooms. Manute’a is Coast Guard certified and can very comfortably accommodate up to 49 passengers. Learn more about Manute’a. To inquire about Manute’a please call 1-949-488-2828. Burial at sea price for 2 hours*: $2,790 plus $264 gratuity. Our luxury power catamaran, Lily, features a beautifully appointed cabin, climate-controlled pilothouse, shaded upper sundeck, and spacious bow, all with cushioned seating, as well as a fully equipped galley. The sundeck and bow both feature rails enclosed with Lexan® glass for wind protection. Lily is Coast Guard certified to carry up to 49 passengers. Learn more about Lily or take a 3D tour of the boat. To inquire about Lily please call 1-949-488-2828. Chevron down How long does the scattering of ashes at sea take? Where do you go? The scattering of ashes at sea typically occurs off of the scenic Dana Point/south Laguna Beach coast, within a one to two hour time frame. To meet federal guidelines we scatter the ashes no less than 3 miles offshore. However, we can also accommodate custom location requests and extended trips. Many folks like to spend extra time with the dolphins and whales that we often find during our excursions. For optimal ocean conditions we recommend a morning departure. Chevron down What should I bring with me for the burial at sea? On the day of your charter you will need to have the Application and Permit for Disposition of Human Remains from the local registrar of births and deaths. If the cremation was done in California it should have been provided with the ashes. Otherwise, you’ll need to contact the Orange County Health Care Agency at 714-480-6700 to obtain the burial permit. It can usually be picked up same-day at their Santa Ana location. Chevron down Can I bring flowers for the burial at sea service? Absolutely! You may bring flowers or wreathes (no wires please – biodegradable components only) to be scattered at sea too. Tip: flower petals look especially beautiful when scattered on top of the water and make a lovely memorial marker. McCool Flowers located in Laguna Niguel serves the South Orange County area, including Dana Point. They can be reached at 949-488-7988. Chevron down Do you play music during the burial at sea? We have a sound system on board each vessel. You’re welcome to bring a CD or iPhone/iPod to play your favorite music. Chevron down Do you serve refreshments? You are welcome to bring your own food and drinks from home, or, purchase items at our Dolphin Deck when you check in. If you’re extending the trip beyond the minimum time frame we can also provide refreshments. Chevron down How will I know where the ashes were scattered? A personalized certificate containing the date and coordinates of the burial at sea service will be provided at no additional cost. Losing a loved one is never easy, and all of us here at Capt. Dave’s extend our deepest sympathies to anyone grieving such a loss. 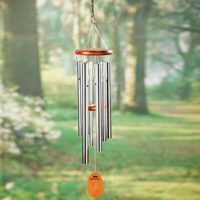 As a part of our Burial at Sea package, we offer these complimentary wind chimes, engraved with the name of your loved one. Adding refreshments to your ash scattering is a great way to honor your loved one by including their favorite food or beverage. Or, celebrate their life with a champagne toast! Floral arrangements, ocean friendly biodegradable wreaths, or flower petals add a beautiful touch to any burial at sea. Our local florist and their award winning design team can help you create the perfect fresh flower arrangement. Bring your favorite music to enjoy during the memorial. All of our boats are conveniently equipped with connections to play music from your Apple or Android mobile device. During the ash scattering attendees are welcome to share their thoughts, poems, and memories. We can also arrange for a minister or officiant to say a few words. They’ll work with you to create the perfect memorial for your loved one. "My siblings and I, along with our spouses and adult children, chartered Capt Dave’s to scatter our parent’s ashes at sea. We extended our charter so that we could enjoy the ocean and all that it has to offer. Dolphins guided us through the waters as we cruised the ocean. A blue whale appeared both before and after our ceremony of scattering the ashes. It couldn’t have been more perfect. From the first day that we contacted Capt Dave’s to inquire about a charter to our last good-byes on the day of the charter, everyone we dealt with was wonderful – professional, informative, caring and so, so friendly. Many thanks to everyone at Capt Dave’s for making our day a wonderfully memorable one – the perfect tribute for a very special couple." "Captain Dave’s staff; office and crew did an excellent job handling our Ash Scattering ceremony. They were respectful, safe and courteous, handled all of the details for us, and even added light to the event. I highly recommend them if you have to send someone off. They will treat you right and help you to say goodbye in the most beautiful way possible. I’ll definitely call them in the future for some recreational whale watching!" "Awesome, awesome and awesome. They were prompt, curious and professional the whole way. We chartered a boat through Captain Dave’s to spread my late father-in-law’s ashes. Shannon, the person who assisted me with the order, was fantastic and very responsive to all of our needs. Captain Tom was extremely professional, helpful and very friendly. Everything from start to finish went off without a hitch and with a high level of dignity. It was the exact send off and closure we were looking for. Definitely recommended. Thank you so much to everyone at Captain Dave’s!" "This Father’s Day we had a burial at sea for my father. I want to thank everyone at Captain Dave’s for making this difficult time a wonderful experience. Everyone did an amazing job. Shannon (who made our reservation), Captain Marie and Allison were sympathetic, compassionate, respectful and did a wonderful job explaining the process to us. Right after we put my father’s ashes in the sea and the flowers on the water, we were turning around to head back and encountered a pod of over 100 dolphins! They were playing all around the boat, and there baby dolphins too. It was so very special. We have used Captain Dave’s in the past for whale watching, and will continue to use them in the future. I have already told multiple people how wonderful their entire team is and that I highly recommend them."